mr gryzor wrote: The original BOOST bar. Red wrapper. Coconut and caramel filling. Disgusting! No wonder it didn't last. The peanut and biscuit ones were much tastier. Grabbed a few import cans from a sweet shop today. I've already had the Fanta and Pepsi flavours in the past and really liked them so the Dr Pepper Cherry was the only 'new' one. It was a big letdown as well since it tastes almost the same as normal Dr Pepper. Oh well, you have to try these things! Used to love Tab Clear! Dont think ive seen it for years anywhere!!! mrpearce1985 wrote: Used to love Tab Clear! Dont think ive seen it for years anywhere!!! Every time someone mentions Tab , I always think of Back To The Future! Back to the Future 2 when he asks for a drink at the bar? He asks for a Tab? And didn't Marty ask for a Pepsi Free at Café 80s? Well some shops sell retro sweets and drinks so I thought someone may have seen it being sold somewhere. There's a shop near me that dedicated to retro/American sweets; they have some cracking stuff in there, sadly no Tab. Marty actually asks for a Pepsi free, then a Tab, then 'Anything without sugar'....I think. Megamixer wrote: Grabbed a few import cans from a sweet shop today. 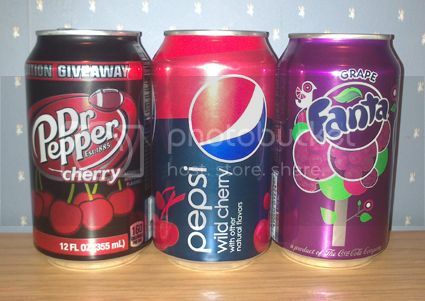 I've already had the Fanta and Pepsi flavours in the past and really liked them so the Dr Pepper Cherry was the only 'new' one. It was a big letdown as well since it tastes almost the same as normal Dr Pepper. Oh well, you have to try these things! pretty sure they;re selling 24 packs of these (well, not the grape fanta, but "real sugar pepsi" in it's place, and the other two) in tesco for £9 at the moment (from about £14). they also started selling 20 pack boxes of twinkys for £8.50! Outrageous..
Just had my first ever can of root beer - is it supposed to taste like that pink mouthwash you get at the dentist? I got a bottle of it for Xmas - if you want the "proper" stuff that Americans go on about, you want to find sarsparilla. It's nice! Butter beer's also nice. Anybody know if you can still get those potato Hula Hoops that went in the oven? I'm trying to remember a specific sweet here - or at least what it was called. If anyone can help me you'll end...erm...hours of hair-pulling. Basically it was based on the Popeye franchise, and it was one big sweet which I think came on a plastic loop of some kind. It may have been shaped like a Popeye character, and it was a similar colour/texture to the Swizzle stick you get with Double Dips. It tasted like a cross between that and the white section of a double lolly. It also made your tongue bleed. It was delicious though, and I absolutely loved them. Does anyone else remember these, and what they were called? They'd have been about during the early to mid 90s. I'm pretty sure they're still available as an Iceland exclusive. They introduced the range (along with a frozen potato version of McCoys crisps) in September of last year. The bacon Pot Noodles. They were great until the scare stories caused them to be discontinued.